We’d love your help. Let us know what’s wrong with this preview of The Last Billable Hour by Susan Wolfe. To ask other readers questions about The Last Billable Hour, please sign up. I picked this book thinking nothing could go wrong; it had two of my favorites things: a murder and lawyers. It turns out I need a little more than that to be convinced. When Howard is hired by Tweedmore and Slyde, he discovers just how little Law school prepare you for the real work. So do we. For the first third of the story, Howard struggles to find a balance and meet deadlines, throwing us Latin quotes and big words like subpoena every couple of page. Any fan of legal drama is in their elemen I picked this book thinking nothing could go wrong; it had two of my favorites things: a murder and lawyers. It turns out I need a little more than that to be convinced. When Howard is hired by Tweedmore and Slyde, he discovers just how little Law school prepare you for the real work. So do we. For the first third of the story, Howard struggles to find a balance and meet deadlines, throwing us Latin quotes and big words like subpoena every couple of page. Any fan of legal drama is in their element witnessing Howard lose sleep and weight as he becomes the partners’ slave. I really enjoyed that part at first, but it soon became repetitive. This books starts off quite slow and never really manages to build up speed or tension. I really hoped the killing of Mr. Billable would set the wheels in motion, but even as Howard gets hired by the detective to dig around and help with the investigation, the pace remained sluggish. Throughout the book, I had the feeling the actual plot was Howard’s life as an associate, the murder only being an element for him to work on. Despite a few red herrings thrown at them, neither the police nor Howard needed to dig very deep to find clues and answers which were served to them on a silver plate. I found it hard to believe that seasoned lawyers and secretaries, known for keeping their mouths shut, would ever turn to a first-year associate to spill the beans. There were too many characters and too little to tell them apart, which really confused me until late into the story. The story between Sarah and Howard fit perfectly into the investigation, although it felt sometimes a little rushed or unnecessary. There are small changes in Howard as he experiences what it really means and what it truly takes to be a lawyer, which added depth to a character that otherwise would have stayed in my mind as the insecure overworked guy who did not have the guts to practice law and would never make it to partnership. I was happy to see his character grow and figure things out for himself. I am glad I read until the last pages, as I felt the ending was okay and saved the story for me. Overall, this book was a fast read, but definitely not what I had expected. There were just too many details bothering me to really enjoy the book. I cannot give The Last Billable Hour more than 2 stars, although perhaps someone less picky might give it a 3. I would like to thank the publisher for sending my a copy of this book in exchange for an honest review. This was a great little mystery novel. In a very short period, Wolfe develops a set of characters that keeps a person engaged. Absolutely loved it! And hated it at the same time. Reading defensively, as a retired workaholic myself who is only now learning how to cook, I found myself skewered with relish! Kebabbed! Or is that ka-bobbed?! Over and over again, with a clever mix of perspicuity and sarcasm applied liberally throughout this battering ramekin of a first book by Susan Wolfe. A lawyer herself, Wolfe gleefully spoofs and spoils the vainglorious world of high-priced attorneys and their hundred-hour work week lives Absolutely loved it! And hated it at the same time. Reading defensively, as a retired workaholic myself who is only now learning how to cook, I found myself skewered with relish! Kebabbed! Or is that ka-bobbed?! Over and over again, with a clever mix of perspicuity and sarcasm applied liberally throughout this battering ramekin of a first book by Susan Wolfe. A lawyer herself, Wolfe gleefully spoofs and spoils the vainglorious world of high-priced attorneys and their hundred-hour work week lives in glitzy glass high-rise buildings. *French culinary term thanks to Ruhlman’s Twenty: 20 Techniques, 100 Recipes, A Cook’s Manifesto. By Michael Ruhlman, c 2011, Chronicle Books LLC. This wasn't as lighthearted as I expected -- it's a mostly serious murder mystery set in a California law firm in the 1980s. It reminded me of early books by John Grisham and Sidney Sheldon, with a classically overworked associate who tries to make up for feeling overwhelmed by working even harder. It seemed clear to me that the author had actually worked in a law firm -- the details rang as true as the overall architecture of the setting. Of course it's somewhat dated: corded phones, hard copie This wasn't as lighthearted as I expected -- it's a mostly serious murder mystery set in a California law firm in the 1980s. It reminded me of early books by John Grisham and Sidney Sheldon, with a classically overworked associate who tries to make up for feeling overwhelmed by working even harder. It seemed clear to me that the author had actually worked in a law firm -- the details rang as true as the overall architecture of the setting. Of course it's somewhat dated: corded phones, hard copies of treatises, filings that have to be done in person at the courthouse, actual carbon copies. But technology aside, the inner workings of a law firm, and the power struggles therein, still feel very modern. The resolution was satisfying, and the glimmer of a love interest was believeable and un-forced. Lots of characters to keep track of. Had some trouble following through the first half. Got a handle on it, but there were still switchbacks that took me some time to figure out. Howard is surprisingly likeable. The ending is okay, a little vague. I chanced upon this book in Düsseldorf and bought it for just a euro but I read it in German translation and it is probably even better in English. This work is considerably better than the majority of whodunnits which pour off the press and Susan Wolfe is more accomplished than at least two more famous writers of murder mysteries that I can think of-Ngaio Marsh for instanc or the abysmally overrated Ian Rainkin. She succeeds where they fail, in providing a creidbly plot with credible and subtle I chanced upon this book in Düsseldorf and bought it for just a euro but I read it in German translation and it is probably even better in English. This work is considerably better than the majority of whodunnits which pour off the press and Susan Wolfe is more accomplished than at least two more famous writers of murder mysteries that I can think of-Ngaio Marsh for instanc or the abysmally overrated Ian Rainkin. She succeeds where they fail, in providing a creidbly plot with credible and subtle and three dimensional characters with not only a profile for the present but with a past that drives them and distorts their judgements. The writer produces a convincing account of the shark pool gambits of American corporate life. There is in addition a world weary undertone, not overdone, questioning the sense of it all. I felt that the murder and quest for the murderer was almost incidental to the plot and I wonder if the novel could not have been written as well or even better without a murder theme at all, but probably Susan Wolfe would not have then found a publisher if she had refrained from introducing at least one corpse. Murder sells and everyone who wants to sell a novel considers writing yet another murder mystery, a genre for which the Western reading public has had an apparently insatiable appetite for about the last hundred years. I just re-read this book and it's as good as I remembered. It's several things at once: a murder mystery, a comic novel, a moral tale, and a skillfully drawn depiction of certain high-octane years in a Silicon Valley law firm. And the theme is still current: Howard’s insecurities will resonate with young lawyers struggling to develop their legal skills as they adjust to the directive of the billable hour. The world of Tweedmore & Slyde is glamorous (and daunting) to its newest associate, Howa I just re-read this book and it's as good as I remembered. It's several things at once: a murder mystery, a comic novel, a moral tale, and a skillfully drawn depiction of certain high-octane years in a Silicon Valley law firm. And the theme is still current: Howard’s insecurities will resonate with young lawyers struggling to develop their legal skills as they adjust to the directive of the billable hour. The world of Tweedmore & Slyde is glamorous (and daunting) to its newest associate, Howard Rickover. After Leo Slyde, the “king of the billable hour,” is found stabbed to death, the homicide detective enlists Howard in investigating who might have had a motive to do away with Leo. Howard and Sarah Nelson, the investigator, become our touchstones in this world of nastiness and pretense. Readers will laugh out loud as the two rumpled investigators confront some of the hotshot lawyers and uncover a variety of unsavory facts. What a fun, and funny book. It is engaging and entertaining, with great dialogue and writing. I'm not big on mysteries, but this book is so much more than a whodunit. What hooked me was the characters – – Sarah, the rumpled detective, who doesn't care if no one is impressed, and Howard, the struggling young lawyer, just trying to keep from losing his job, not to mention the array of colorful personalities they encounter. I loved the intelligent and nuanced examination of what in the A great read! What a fun, and funny book. It is engaging and entertaining, with great dialogue and writing. I'm not big on mysteries, but this book is so much more than a whodunit. What hooked me was the characters – – Sarah, the rumpled detective, who doesn't care if no one is impressed, and Howard, the struggling young lawyer, just trying to keep from losing his job, not to mention the array of colorful personalities they encounter. I loved the intelligent and nuanced examination of what in the end really matters in the lives of the very successful and not so successful. I reread the book recently and enjoyed it just as much as the first time – – a keeper. Can't wait for the author's next book! "1990 Edgar Award for Best First Novel; Finalist 1990 Anthony Award for Best First Novel; Finalist 1990 Macavity Award for Best First Novel" So far author Wolfe must be regarded as a one book wonder. This fabulous first effort has not been followed up. Thriller - Howard Rickover is an unassuming new associate at the high-powered firm of Tweedmore & Slyde, attorneys to SVM (Silicon Valley Millionaires). When Leo Slyde is murdered in his office there are a wealth of suspects and homicide detect "1990 Edgar Award for Best First Novel; Finalist 1990 Anthony Award for Best First Novel; Finalist 1990 Macavity Award for Best First Novel" So far author Wolfe must be regarded as a one book wonder. This fabulous first effort has not been followed up. Thriller - Howard Rickover is an unassuming new associate at the high-powered firm of Tweedmore & Slyde, attorneys to SVM (Silicon Valley Millionaires). When Leo Slyde is murdered in his office there are a wealth of suspects and homicide detective Sarah Nelson recruits Howard's help in uncovering the secrets within the firm. What a great little mystery! The Last Billable Hour is the story of a young lawyer who finds himself improbably hired at a very hot Silicon Valley law firm in the late '80s, and plunged in over his head in more ways than one. The setting is distinctive, and as a SV local I find it kind of nostalgic, but the real appeal of the book lies in the light hand of the storyteller, giving us charming leading characters with a story that moves steadily along. Never dull, lots of understated humor. And the What a great little mystery! Rumpled, overweight Howard Rickover, the Silicon Valley firm's newest lawyer--and, therefore, flunky--hits his stride when he helps police detective Sarah Nelson find out who stabbed firm partner Leo Slyde. While not always totally convincing (and never surprising), the plot does provide insight into an intriguing world of legal subterfuge. This was Wolfe's only book and I could see why. It was okay, but only okay. Wonderful mystery story set in a large silicon valley law firm in the late 1980's. Ms. Wolfe was a practitioner at such a firm and accurately explains quite a bit about the life those lawyers lead. Won an Edgar for best 1st mystery. I and my Mother--a big mystery buff who loved and gave me this book--were both disappointed Ms. Wolfe did not write a sequel or ten. Edgar Award winner and it's easy to see why. This book was thoroughly engrossing and frighteningly accurate in its portrayal of life at a big law firm. Highly recommend. The last billable hour is an entertaining and even educational read. A mystery involving a fancy law firm in the San Francisco Bay area, in an area known as Silicon Valley. The writer deftly develops the culture and ambiance of a big city law firm during the 1980s, when there was more money than god could count. Our hero is a newly hired associate. Howard, our hero, is not yet savvy and worldly. 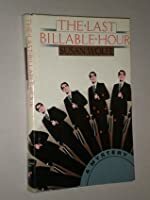 He is also somewhat naïve about what occurs in the big bad high-stakes legal world that he is a part The last billable hour is an entertaining and even educational read. A mystery involving a fancy law firm in the San Francisco Bay area, in an area known as Silicon Valley. The writer deftly develops the culture and ambiance of a big city law firm during the 1980s, when there was more money than god could count. Our hero is a newly hired associate. Howard, our hero, is not yet savvy and worldly. He is also somewhat naïve about what occurs in the big bad high-stakes legal world that he is a part of. When a partner is murdered, Howard is thrust into the middle of the police investigation. The plot is multi-layered and twisty, leaving the reader with possibilities and probabilities about the perpetrator and why the partner was killed. I was completely entertained by this legal thriller that was a mashup of Agatha Christie and Pink Panther. The bumbling lawyer in a firm where everyone has a motive for killing the victim. I thought the author's humor was very clever. I smiled a lot while reading. The author has a narrative trick she uses that doesn't always work but when it does is pretty cute; She'll change topic dramatically in the middle of a paragraph to indicate the protagonist's mind is wandering. This was an enjoyable, fun read. Especially liked the protagonists, but also liked the depictions of the lawyers, who were intentionally caricatured a bit to give it a slight tongue-in-cheek feel. Faced-paced with snappy dialogue. When I started out in the corporate world, I felt kind of out-of-place and overwhelmed, like a Howard. A lot of sharks out there, everywhere. That kept it real. Yep. Good stuff. The intrigue of a murder happening to a founding partner of a very successful Silicon Valley law practice. All the secrets of all the attorneys and support staff are revealed in the quest to find the killer. And the newest associate is recruited to help the police solve the crime. Many red herrings later the killer is unmasked. May not encourage anyone to a law career but will intrigue those who love mysteries. 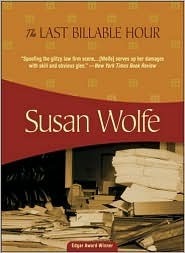 Author Susan Wolfe offers an easy to read Edgar Award Winner with The LAST BILLABLE HOUR. All the essential action takes places in a law firm in San Mateo, CA. Suspects emerge among the law firm employees and each has their own story to tell. Eventually the murder is solved and everyone lives happily ever after. Without a doubt this was the slowest, dullest book beginning I've ever read. The only thing that kept me reading until about 40% of the book was read, is my determination to never not finish a book once begun. It did get more interesting, though not totally believable; but then the ending left me flat. I would never recommend this book to anyone. I read this book on a flyer - it sounded appealing. It was a hit! Sharp use of language, details of deals that could only be relayed by a lawyer author about top end lawyers. Besides that it was a mystery that kept me guessing with great character development. I just ordered her second novel "Escape Velocity." I'm hoping it follows the same characters, but doubt it. An unexpected gem.